Elders say that before bringing a newborn to parks or malls or somewhere else far from home, she should first be baptized to put her under God's care and protection. And because we know that we cannot contain our wanderlust for too long, we planned Maddie's baptism just a couple of months after her birth. Invitation made by Mommy, of course! Quick note: Her baptismal gown and shoes as well as the other dress are all from the Philippines. Baby clothes here are nice but quite expensive so we buy from PH whenever there's a chance. On April 20th, coinciding with the Easter Sunday of 2014, Maddie was officially welcomed to God's family. The ceremony was held at the Church of Saint Michael and was officiated by Fr. Angel Luciano, the chaplain of Filipino migrants in Singapore. There is no special baptism here, which explains why there are so many people in this photo :) All ceremonies are communal because each church holds only one baptism every 2 months. We didn't pay anything for it though, and an offertory envelope/stipend is completely voluntary. The Certificate of Baptism is given right after the ceremony! How efficient things are in SG! With Maddie's Ninongs ang Ninangs. A quick side story: It is a requirement for infant baptism here that the parents are married in Catholic church and since Jhay and I are only civilly wed, we also had a wedding convalidation on the same day. A convalidation is a ceremony with the exchange of marital vows, blessing of the rings and signing of the contracts -- pretty much a church wedding without the glitz and glamour! Haha. Our witnesses -- beside me is Maribel, my former colleague while the one next to Jhay is his cousin Ronald, who is also based here in SG. Again, the Marriage Certificate was handed to us afterwards. After the baptism, we feasted on some classic Filipino dishes at Gerry's Grill (yes, the same one that we have in the Philippines!). They have set menus or you can create your own as long as it sums up to a minimum of S$20/pax. 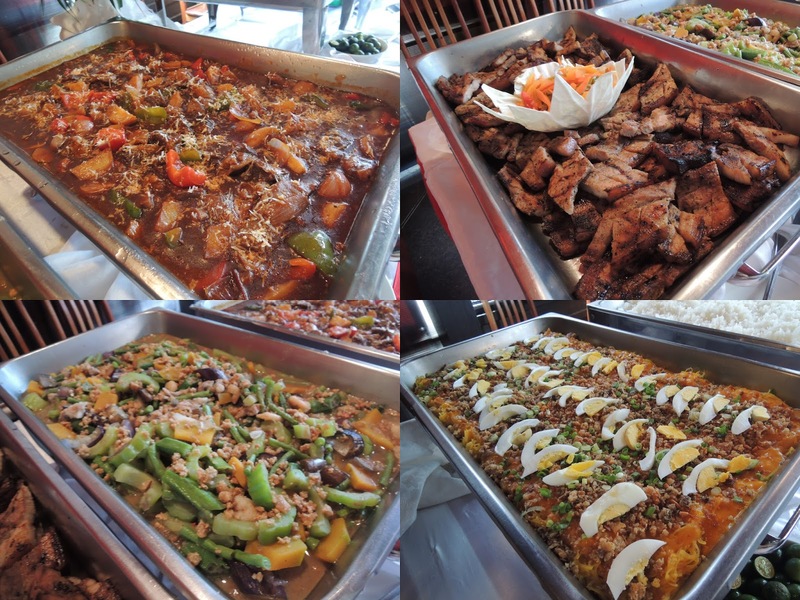 We preferred to customize so our spread consists of Beef Caldereta, Grilled Pork Belly, Pinakbet and Palabok. Our set also includes Crispy Chicken Skin for starters, plain rice and assorted canned drinks. Both food and service are good so we keep coming back to Gerry's! 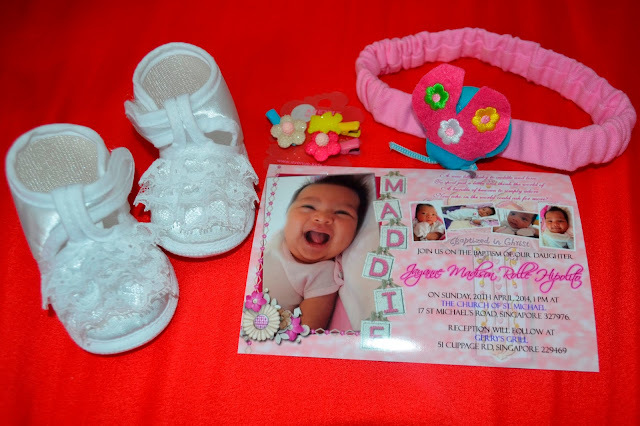 Aside from the sponsors, we made it a point to invite our friends here as our way of saying thank you for showering me and Maddie with gifts and well wishes even before her arrival. That's Calix, another baby from our friendship circle. He's a year older than Maddie, though. We got her cake from a local bakeshop Bengawan Solo and some customized red velvet cupcakes from Twelve Cupcakes as giveaways. Thank you so much Godparents, Aunties and Uncles for celebrating with us! And for all these presents, too! Hi! We're also planning to have the baptism of our daughter in SG. May i know if Father Luciano still the officiating priest? And yung convalidation, happens when before or after the baptism?